Mushrooms harvested manually and dehydrated between 40 ºC and 55 ºC. Of brown color these mushrooms are especially fleshy, with a bell curve that can measure between 5 and 25 cm in diameter. Its pulp is aromatic, juicy and spicy, making this variety one of the most appreciated and consumed in the world. In Asian countries, they have been used as a symbol of longevity thanks to their health benefits. 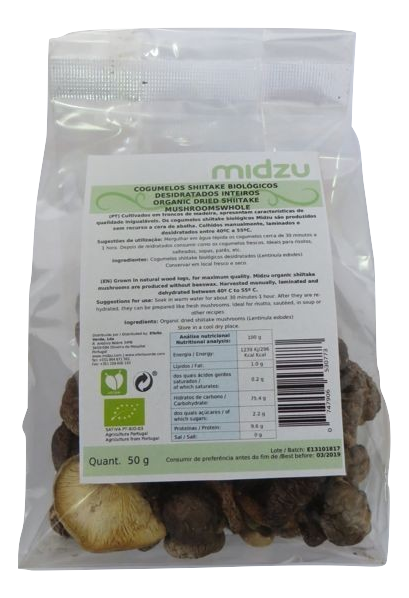 Midzu shiitake mushrooms are produced without beeswax. Manually harvested, rolled and dehydrated at 40 ° C to 55 ° C.
Suggested use: Soak the mushrooms in warm water 30 minutes to 1 hour. After rehydrated consume as fresh. The water can then be used as broth for soups or sauces. Ideal for risotto, sautéed, in soups, pâtés or as a side dish.